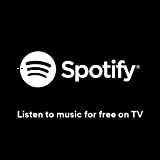 Now everyone can listen to the music they love for free with Spotify on Fire TV. Browse all your favourite albums, songs and playlists, and watch beautiful album artwork appear on-screen. Controlling the music is easy too - just use your Fire TV remote, mobile phone or tablet.